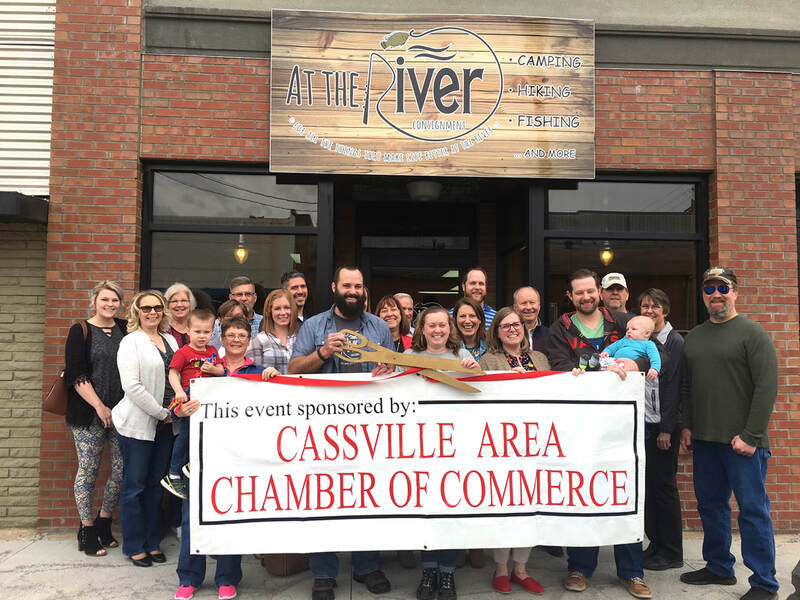 At the River Consignment recently held a ribbon cutting with the Cassville Area Chamber of Commerce celebrating their new location. They are now located at 805 Main Street in Cassville. Pictured above, from left to right, in the front row: Charlene Sheets, Connor Madsen, Sam Madsen, Jenny Madsen, Skyler Bowman, Levi Bowman and Evan Bowman. Middle row: Stephanie Parsons, Wanda Whyte, Natalie Lindley, Linda Cowherd and Carri Cowherd. Back row: Macey Parsons, Brenda Moore, Gary Whyte, Ben Lindley, Laura Holycross, Mark Smith, Chad Johnson, Bob Allen, Terrie Zornes, Carolyn Bishop and Shane Cowherd. Pictured above is some of the jewelry selection offered by a vendor in At the River’s new location. A couple with a small dream ended up with big success in Cassville. Sam and Jenny Madsen opened At The River Consignment in November 2016, and since then, they’ve had to expand their business, bring in vendors and offer much more to the public. The Madsens began At The River because of their love for the outdoors. The shop focuses on consigned outdoor gear, including some new stock, as well. 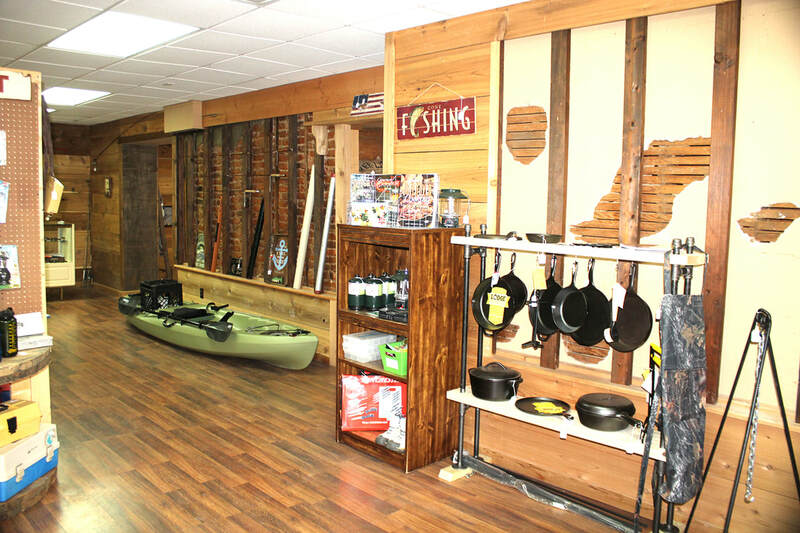 Whether it’s fishing poles, tents, life jackets, camping gear, fly tying equipment, knives and more, it can be found at their shop. They opened in Cassville because of their love for Roaring River State Park and how much they enjoy the area. Since then, their business has done nothing but grow. The space is so much larger than their old location, initially they were a little concerned about filling it. Jenny said the first two rooms were easy to fill with their current stock. The back two rooms, they opted to open up to vendors who follow in the same theme as the shop. Vendors’ items include jewelry, handmade or refurbished tobacco pipes, wood carvings and décor, cedar furniture, outdoor themed t-shirts and mugs, and more. However, Jenny said that everything still fits in with their vision for their store. The larger location just opens up the variety and options their customers have. They also place fliers in cabins and rooms around the state park, which lets visitors to the area know they are there and have equipment available for sale. As an added bonus, At the River is also offering community classes and events to draw people in. Recently, they held a fly tying class as well as a photographer who did Easter pictures at the store. Jenny said there are plans to hold additional classes in the future, probably closer to summer. At the River is located at 805 Main Street in Cassville and can be reached at (417) 793-5179 or on Facebook. All of the store’s new inventory and events are added to their Facebook page. They are open Tuesday through Friday from 10 a.m. to 5 p.m. and Saturday from 9 a.m. to 1 p.m. They are closed on Sunday and Monday each week. The Madsens say the design of the space and the extra square footage made them able to expand their store in a way that makes sense for their business. They are also now able to carry vendor merchandise, as well.